If you are a bourgeois metro kind of guy who uses words like “incroyable”, then this is the fruit for you! Yellow and green variegated stripes – like a pear shaped kindergarten zebra OR if you turn it upside down, a totally cool hot air balloon. Dark raspberry pulp. Sweet figgy goodness – the way I assume fig jam would taste if I had ever tried fig jam. As far as figs go, this is a delicious one, full of sugar and fun. It tastes like figs and berries all mixed into one. I would (and did) spread this right on toast with honey. (What? you don’t mix jam and honey? Wimp!) Still just a fig though, not a favorite for me even on its best days. Sorry fig lovers of the world. So sorry. Also called Tiger Fig. Dried figs were first sold in a commercially manufactured cookie in 1892. And thank goodness or else most of us here in the US would have never even dabbled in the world of figs. I don’t know about you, but if it comes as a cookie then I’m in. Also – I know it is a bit late in the season to post a fig, but I saw a few at the Farmer’s Market this week, so they are just barely hanging on. 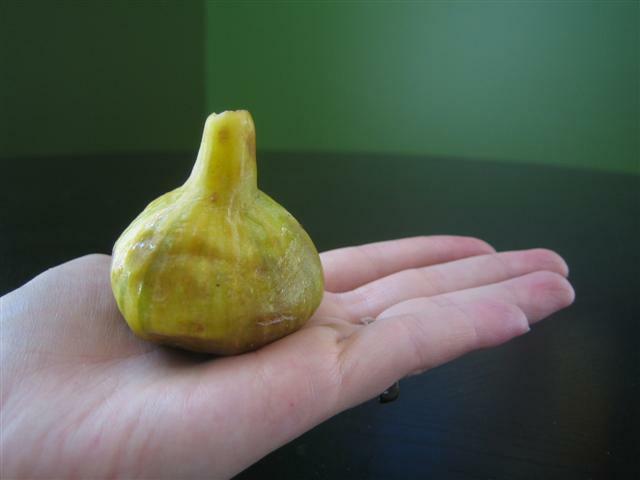 If you love love love figs, you can probably still get a few mediocre ones if you really try. 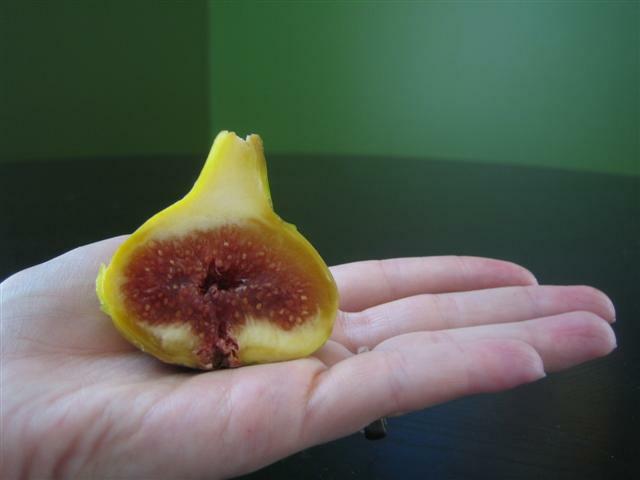 I grow this fig and was really disappointed until I left a few on the tree until they looked practically rotten! Then and only then did they taste superb. The secret is to leave on the tree until the last moment and hopefully before the birds and vermin eat them!